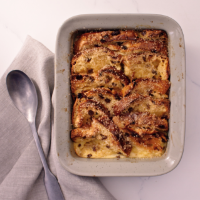 Panettone is delicious on its own, but it's wonderful in this bread and butter pudding recipe. Serve with cream for extra indulgence. Preheat the oven to 180°C, gas mark 4. Butter a 1½ litre ovenproof baking dish. Layer the slices of panettone in the dish. Beat the eggs together in a measuring jug, add the milk, double cream and 25g sugar. Pour this over the panettone and set aside for 15 minutes to allow the custard to soak in. Sprinkle with the remaining 25g sugar. Place a large, deep roasting tray on a low shelf in the oven and half fill with boiling water. Place the pudding dish in the roasting tray and bake for 35–45 minutes until the custard has set and the top is golden.